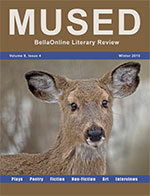 Congratulations to Carol F, Bob E, Anne M, Mike Z, and Lisa S for being featured in the Winter Solstice issue of the Mused Literary Review! They’d love to hear your feedback on it! Have a delightful week :).